Stade Chaban-Delmas in Bordeaux regularly accommodates roughly 1,500 away supporters. However, seeing very low interest among local fans (disillusioned by the team's poor results – last spot with 3 points), Girondins agreed to allow more German fans inside. As Eintracht Frankfurt are in first place and are most likely to win Group F, supporters have started a real invasion plan. Now, one week ahead of the 28 Nov game, already over 10,000 tickets have been sold to fans from Frankfurt. Overall more than 12,000 are expected to make the 1,100km trip next week. 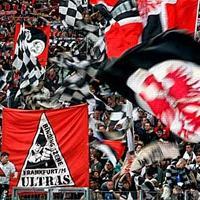 Eintracht supporters have often proven themselves. Their away trip to Danish Broendby from 2006. The large away following made the entire concrete stand bounce as they launched their "Pippi" dance.